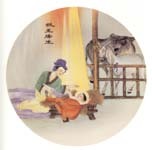 Circle of Pneuma in Australia has these great images from China of the life of Jesus. These pictures: 1. Nativity and 2. The Woman at the Well. UPDATE: I like these a lot better than Western images of Jesus. 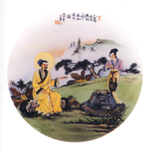 Thanks for the link to my post on Jesus in Chinese Art. Much appreciated. I hope it stimulates some productive reflections about contextualisation. There are some marvellous opportunities for those with discerning eyes to reach beyond the walls of church ghettoes and interact at a very meaningful level with many of today’s adepts and devotees of alternate pathways. My blogs try to push the envelope a bit on the spiritual frontiers facing Christians. as a Chinese (in Malaysia), I’ve always felt a close connection with paintings like these. I decided to us one for this week’s bulletin. Next Post (n)	Will Wicca Be America's 3rd Religion?